the winner of the pillow giveaway is lindsey redfern of therhouse.com. the wonderful kim orlandini entered you by tagging you on instagram. 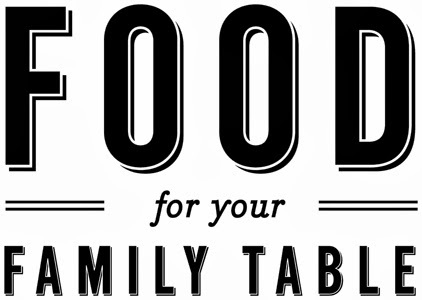 email familytablegiveaway@gmail.com to get the ball rolling with your pillow order. sorry, back to the giveaway. state EVERYTHING has been on trend. but i really like it. it's feels intimate somehow. and it shares a lot of information in a super succinct way. i met emily back in october of this year. she attended one of jon's FIND 2.0 workshops. those are the ones i still cater. i look forward to those days with jon. and not for a break from normal life, because i'm cooking my booty off for 12-20 people for two days. but for the people his workshops attract. it's one of the greatest pleasures of my life so far to be a part of them. and that's how i met emily. it's been 20 minutes since the kids have gone down for bed and i've been sitting here trying to figure out the best way to introduce her to you. here's my spiel (i really thought the word was schpiel...thank goodness for google)...here's my spiel and then i'll let her do the talking. she's really eloquent. a little back story: my favorite part of this particular workshop where we met isn't anything that jon does. my favorite part comes from his partner, kristen kalp. she has this fascinating skill set of being able to sit you down in a big comfortable chair in a room full of virtual strangers and then guide you to find that one thing that lights you up in life and then make a plan (that also lights you up) on how to create and build up a business from it all. that doesn't even come close to describing the phenomenon this really is. but she's putting on a summer camp next year if you're intrigued. and ps, she's the friend who told me i should write a cookbook. the end. so during emily's "hot seat", that's what this time with kristen is called, she started talking about her photography business and some things she wanted to adjust and move around. emily is very successful as a photographer, even voted best wisconsin wedding photographer two years in a row. but then. then she mentioned a business she had on the side. an etsy shop where she sells these fun, hand-made state pillows. and she lit up! she loves textiles. she loves fabrics. she loves making things. she feels about fabric how i feel about cooking and feeding people. and it was inspiring. and exciting. i wanted to tell everyone i knew about these pillows. what i love about emily, and josie and lisa too, is their deep passion to create something. whether with yarn or fabric or even sea shells. lots of people have asked me why the giveaways so far haven't been food related. here's what i have to say about that: this blog isn't just about food. it's about creating things that fill your soul and then sharing those things with others. i'm happiest when i'm creating in the kitchen and then feeding the people i love. that's what i have to give. i've specifically invited like-minded creators to share their passions with you. so don't be surprised to find content here that strays from the topic of food. this place is about finding passions and sharing them. emily describes this as being a handmade girl..."The handmade girl invites creativity into the everyday and embraces the process of making. She believes that making is an adventure. With guidelines, not rules; ideas, not policy. And creativity and functionality live happily ever after. Where the thought of failure isn't an option, because she has such an eagerness to try new things. Where mistakes are seen as beauty and mis-haps as purposeful. The process of making is what drives each new idea. The handmade girl believes in herself. She believes in her creative intuition and knows the value in unabashedly creating. She knows that it's ok to not always know what she's doing. It's ok to be attempting something new. It's ok to get dirty and admit failure. Because this curiosity fuels more creativity!" see? i told you she was eloquent. now don't you want to just jump up and do something that you love?? that's what lots of the giveaways here will be about..."embracing the process of making...where mistakes are seen as beauty and mis-haps as purposeful." this is good stuff you guys! A whimsical and awesome STATE SHAPED pillow that is a perfect and fun graphic element for your home! Throw it on your couch, a welcome bench in your entry way or on your bed! It's a handmade way to add a personal touch to any room! Made in 100% cotton, designer fabric and embellished with your choice of heart color in 100% wool, any one will love this pillow! Each pillow will measure approx. 16" x 8" when finished (please note each state is a different shape and therefore is finished to a different approximate size; but each pillow finishes around 16" in one dimension). 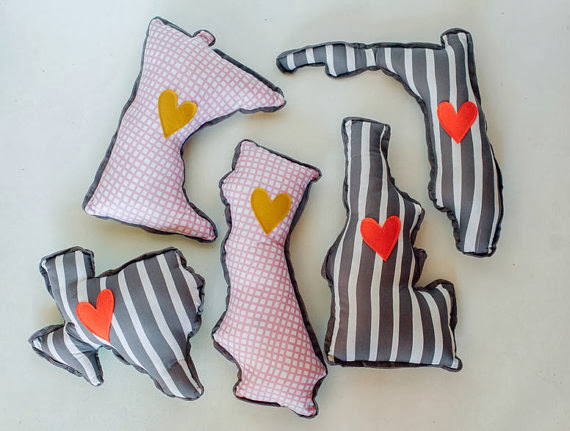 Pick your home state, the state you fell in love or just your favorite state…it's the perfect gift to cuddle up to! just visit emily's shop and then leave a comment here letting me know which state you would choose. i'm so torn between california and hawaii, i think i might need to order both. for an extra entry head over to this pinterest board and re-pin two of your favorite items from emily's shop. just make sure to leave a link to your pins in the comments. p.s. to receive a couple extra "if i were..." menu ideas and secret recipes every month that i only share via email click here. How fun! Hard to choose... but I'd probably have to choose California. That's where we are right now and it's been place of great growth! Callie, I would of course choose Montana, my love for this state is pretty much endless! i already knew your answer on this one :) glad you like the pillows! This is awesome, we definitely want Hawaii! A lot of fun memories and that's where we started our family! Callie, I'm so happy you're doing this! I honestly bought four as gifts when we got home from FIND (what an AWESOME time), but I guess I could enter for one for me :) North Carolina all the way, baby! Love your blog, Callie! I'm so excited to see where this cookbook adventure takes you!! So fun! I would choose Massachusetts! We just moved to Boston and I'm working to love the city, and to love being a first time New England-er! Those ROCK! I'd choose NJ, since I grew up there...but aren't her chair name tags amazing, too?! I would have to default to Utah. It's not always where I feel accepted and at peace but, it's where I grew up and where my family is and is home. These are so cute! Would LOVE a Hawaii one, and if it's just one island, O'ahu for sure! So cute!! i would pick california since that's where i was born and raised! I would pick Alaska! That's where our family started and it will always be in my heart. Yay Callie Davis! I'm torn between Idaho(current home) and California(born and raised home)! hi melanie! sorry for the confusion earlier with the pinterest board and stuff. i changed the post and how to enter to make it a little easier. you'll get an extra entry since you went ahead and pinned your favorites earlier :) thanks chica! of course Minnesota! Love miss Em! All your friends sound like such interesting and inspiring people. Them pillows are the cuteness. For me, it has to be Maryland (if this giveaway is still on...Japan time throws me off). As far as Pinterest etiquette, just try to pin from the original source whenever you can (rather than a tumblr blog or roundup), but you probably already knew that! Tennessee, totally. Or Canada, which is a state of happiness. I love these pillows. I would choose Idaho. Thanks for the chance to win and the words you wrote about finding your passion.